The Armed Forces community includes people serving in the Armed Forces as regulars or reservists, volunteers, ex-forces members (veterans) and family members of past and present service personnel. 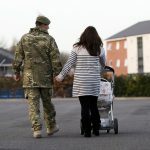 As not much is known about the Armed Forces community in Northamptonshire, Healthwatch Northamptonshire carried out a survey on behalf of the Armed Forces Covenant Northamptonshire to find out more about the health and social care needs of this community. We are currently carrying out a similar survey with Healthwatch Rutland. The report recommendations call for greater awareness of the Armed Forces Covenant amongst health professionals in the county, more timely access to suitable mental health support, and further preparation for civilian life when people leave the armed forces. These recommendations will be addressed through the Northamptonshire Armed Forces Covenant Partnership of organisations from across the county who work closely together to ensure the Covenant aims are upheld.